Gardening at MCGA is wonderful. We have so much space to work with I believe we are quite spoiled; we also have full sun which is every gardeners dream. Having the great outdoors at our fingertips means we also have critters of all shapes and sizes at our front door. This garden post talks about plant pests. After you have removed all the weeds and grass from your plot, amended it with all the good stuff you have at your disposal, it will be time to plant and thus time to deal with pests. (1) They exist, they are a part of nature thus part of the ecosystem of the garden and we must live with them. We plant enough for ourselves and the let the pests do what they were born to do. We pick off damaged leaves, removed damaged plants and replant what they take. (2) They exist but must be controlled organically with row covers, diatomaceous earth, neem oil, beer, iron phosphate, lures and other organic methods. We do what is organically possible to curb the taking of too much of our food and spend some energy and expense warding off pests. (3) We wage an all out war against these critters, all of them: moles, voles, slugs, moths, beetles, flies, maggots, wasps, worms, flea beetles, deer, birds, weevils, aphids, am I missing any? I must admit I have tried this and it gets very, very expensive. The amount of stress I felt trying to accomplish this task was robbing me of my enjoyment of gardening. I see-saw between all three ways of approaching pest problems depending on what plant they are attacking, how dear that plant is to me, what time of year it is and how much energy I have at any given time to deal with them. Most of the time, I tend to fight the good fight against weeds more than anything. Last year, every time my bean plants sprouted, they were immediately topped and relived of all their leaves by rabbits. My garden consisted of bright green stems for weeks. I looked around for holes in my fence, planted more beans and in time, the bean plants got a bit bigger and the rabbits left them alone. 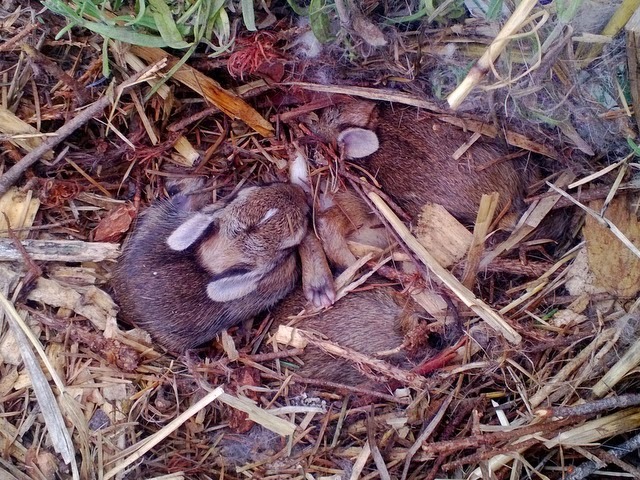 The cute little critters below are rabbits. I found and photographed these babies last year at the garden. I had some plastic fencing around my garden and they chewed through that, I put some 1 inch chicken wire fencing up but the little babies can easily sneak through those little holes. They do eat up a great many, many starts but they are easy to control and deter with fencing and even row covers. I even used giant cabbage leaves to cover up new starts I had planted. Enemy #1 are slugs! 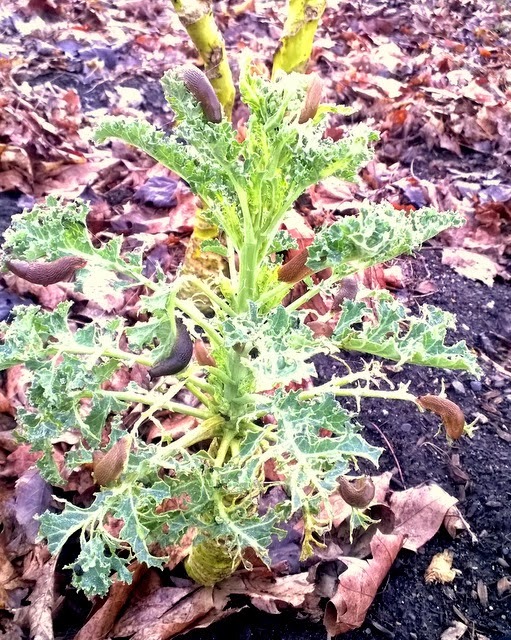 I took this photo two days ago on a kale plant that overwintered from last year. Can you find the 9-10 slugs on this plant? They start out small and it's the smaller ones are the ones that do the most damage. They can defoliate a veggie start in one night. Remember they have all night to feast on your veggies. The telltale slime trails let you know slugs have been visiting your garden. Slugs are very agile and athletic mollusks they can climb to the tops of many mature plants as well. Sluggo or another brand name organic slug bait are acceptable to use at MCGA. Beer traps are also effective, slugs love the smell of the yeast. This is a vole burrow in clay soil, because the soil is firm and compacted, the hole is easy to see. Voles are not solitary animals and where is there is one, there is a family of them. This is a vole hole in my garden. 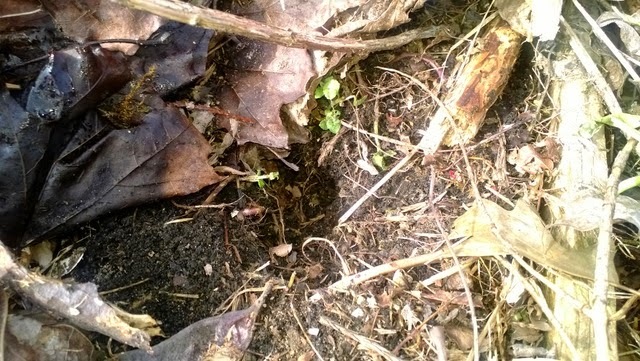 In good soil, the vole hole is often well hidden. Signs of damage to plants and roots include wilting of the entire plant and gnaw marks on root crops. 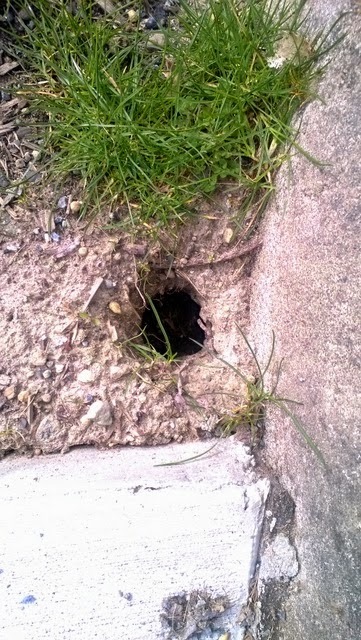 Sometimes the hole reveals itself during watering, a large 'sinkhole' may develop in a matter of seconds at the site of a burrow or run. Voles are called field mice, they look like mice with shorter, stumpier tails. I try to thwart them by adding hardware cloth to the bottom of my raised beds, this helps but they also spend part of their time above ground. You cannot win them all. This is vole damage to beets, they like all manner of plant matter, just the other day I was pruning my blueberry bushes, One bush was slow to bud and upon closer examination, the entire trunk was girdled, chewed to death basically, and the plant just flopped over. 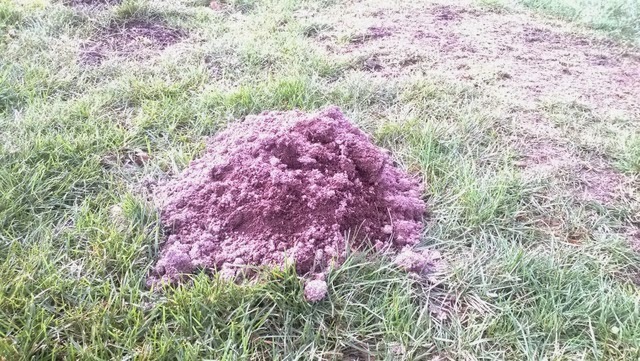 This is a mole hill. Moles only make hills, not holes. They run along tunnels and eat worms and grubs, they are carnivores, they do not eat plants. Their burrowing however can disturb roots and therefore adversely affect plants. I particularly do not like it when they unearth soil onto my wood chip paths. The new soil makes a great growing ground for weeds! They are solitary animals and sometimes they just go away on their own to explore other garden plots, sometimes they visit the same tunnel in the same plot over and over. I do not recommend trapping for moles or voles. We have many beneficial animals that live at the garden like a black footed weasel (who likes to eat moles and voles and baby rabbits), to accidentally trap him would be unconscionable. Birds might also be attracted to traps and to lose even one bird in a trap would be sad. Avoid all traps please! Last but not least, we have deer that come through the garden. Deer are seldom a problem, they nibble here and there, leave some nutrient rich droppings but don't do too much damage. I let them nibble at my raspberry brambles but they seldom touch the fruit. If you have a garden fence and you notice tips of plants have been nibbled, often deer have visited your garden. I over plant (plant more than I can eat) for three reasons. I know pests will eat some of my produce, I like to donate produce to Hopelink and I love to give veggies away to my garden neighbors. Last year I gave away over 20 eggplants needless to say, I have more than enough to eat. These are my kale and salad greens after 4 weeks in the house, I moved them into 4 in pots in a little cold frame on my balcony. I will keep them in the cold frame for 2 more weeks then out of the cold frame for another week before planting out at the garden. REMEMBER, starts that you buy at the grocery store, nursery, or hardware store may not have been hardened off sufficiently. It is best to harden them off at home for an additional time just to be sure. Plant them in your garden on a rainy or cloudy day with a small handful of organic plant food and they should grow well for you for the rest of the season. Gina and Rob, our esteemed registrars have been gardening intensively in their plots. They store much of what they harvest and here is a quick narrative and inventory of what they are eating from their winter larder. I just dug up some potatoes in mid-February that had been winter stored (left right in the ground) where they grew last summer - and they are yummy! I have some frozen rhubarb that is ready to be made into rhubarb preserves/jam. Ready for use, I still have tons of fresh, organic garlic (my husband often eats 5 cloves of freshly-baked garlic on toast each day!). We have many freshly-picked late-summer tomatoes now canned in glass jars, ready to be made into a flavorful spaghetti sauce. From the freezer, I just cooked some of my frozen Swiss chard that became the main part of a hearty soup. Cilantro seeds are ready to be crushed into coriander, but might become this year's cilantro plants if I plant them in the soil. My dehydrated celery, onions, and yellow squash slices are being used in soup making this winter. I am already picking fresh chives and Chinese garlic chives straight from the garden! As you plan your gardens, consider what plants you'd like to grow and what plants you would like to eat so that you can enjoy their bounty in the spring, summer, fall and winter... it took years to figure it out, but year by year there was more that we could can, freeze, dehydrate and preserve. This Saturday, March 14th, I will drive to Seattle to obtain from the Seattle Tilth Plant sale most of my organic vegetable starts. I have orders from a couple of my gardening friends to get them broccoli starts in particular.